Sleep deprivation prevents your immune system from building up its forces. If you don’t get enough sleep, your body may not be able to fend off invaders. It may also take you longer to recover from illness. 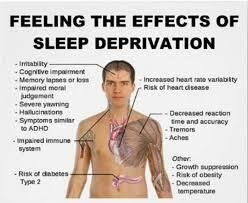 Long-term sleep deprivation also increases your risk for chronic illnesses like diabetes and heart disease .